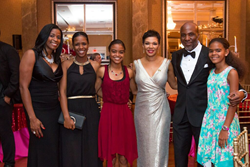 President of the Foundation, Marlene Gordon, poses with husband, Charles Gordon, Jamaican Ambassador to the U.S., Audrey P. Marks, and students, Ashalyia Duncan, Britney Peart and Tiffany Peart. The Lynne Mitchell Foundation, a nonprofit organization whose mission is to support the educational needs of underprivileged children in Jamaica, hosted its fifth-annual philanthropic gala on Saturday, October 14th. This year's theme, A Night at the Masquerade Ball, was a stunning success that featured a luxurious sense of elegance and ambiance at the Coral Gables Country Club. Guests enjoyed decadent cocktails and hors d’oeuvres, a 3-Course Dinner, fabulous silent and live auction items, entertainment and a rocking good time at the live DJ After Party. Through silent and live auction bids and direct contributions, the Foundation was able to raise over $100,000 during the event, all of which will go to resources that will help improve the quality of learning conditions for primary-school children in Jamaica. This year’s gala, honored donors, including the Virginia B. Toulmin Foundation, with Donor of Distinction awards for their contributions to leading gifts of financial support over the past 5 years, which have significantly helped the Lynne Mitchell Foundation to further its mission to improve the educational opportunities of underprivileged children in Jamaica. The Jamaican Ambassador to the U.S., Audrey P. Marks, made a special guest appearance to the event as well and was delighted to be in attendance. In addition to the fundraiser, The Lynne Mitchell Foundation awarded four students from Seaview Primary School in Southfield, St. Elizabeth, Jamaica each with $3,000 high school scholarships earlier this year through its annual scholarship program. The Foundation also serves Seaview Primary School through additional programs like its Back-Pack Drive that provides brand new back-packs filled with school supplies to every student in the school at the beginning of the school year. More information about the back pack drive can be found at https://goo.gl/aY1U6Q. The Lynne Mitchell Foundation was created in 2012 by President Marlene Gordon to honor the memory of her mother, Lynne Mitchell and to continue her legacy of "growing love... one act at a time." The foundation focuses on underprivileged children in the rural community on the island of Jamaica where Mitchell was born and raised. The specific focus of the foundation is on Seaview Primary School with the aim of showing love to these children and changing their lives in a positive and meaningful way. The foundation serves to raise funds for programs including scholarships, transportation, school lunch and breakfast programs and building renovations to benefit the students of Seaview Primary School. For more information about the Lynne Mitchell Foundation and how you can become a Love Activist for the organization, visit http://www.LynneMitchellFoundation.org. The Foundation’s activities can be followed at http://www.facebook.com/lynnemitchellfoundation and on Instagram @lynnemitchellfoundation. Lynne Mitchell Foundation, Inc., is a qualified 501(c)(3) tax-exempt organization. We are also registered with the State of Florida under the Solicitation of Contributions Act - Registration #CH38687. 100% of each contribution is received by Lynne Mitchell Foundation, Inc. A COPY OF THE OFFICIAL REGISTRATION AND FINANCIAL INFORMATION MAY BE OBTAINED FROM THE DIVISION OF CONSUMER SERVICES BY CALLING TOLL-FREE 800-435-7352 WITHIN THE STATE. REGISTRATION DOES NOT IMPLY ENDORSEMENT, APPROVAL, OR RECOMMENDATION BY THE STATE.